After a delicious Honduran Breakfast, how about a Burrito for lunch? Burrito is a type of Mexican and Tex-Mex food,consisting of a wheat flour tortilla wrapped or folded into a cylindrical shape to completely enclose the filling. The flour tortilla is usually lightly grilled or steamed, to soften it and make it more pliable. Today's recipe can be assembled as you watch your favorite show on the TV or guiding your kiddo in his homework or just enjoying your ME time. The filling again can be very versatile and you can almost stuff whatever you like, but see to that you have one or other variety of beans and something saucy to hold the filling and keep it saucy, so it doesn't turn dry and parchy while eating. I made some garlic rice using leftover rice and boiled some mixed lentils with little salt and for the sauce i made a mild salsa like using onions and tomatoes. Though the steps might look lengthy, all it took was 10 minutes to make the rice and the sauce. The Tortilla dough, i had leftover from yesterday's balaeda. So, i just rolled out some fresh tortilla with that and then packed everything before lunch. Mixed sprouts should be soaked atleast 8 hours and pressure cooked with salt until soft. Chop onions and garlic finely. Heat a pan with 1 tsp oil, add the chopped onion and garlic. Saute until the onions turn a bit brown. Chop the onions fine. Wash and chop the tomatoes into cubes. Heat 1 tsp of oil in a pan. add onions and saute until translucent. Next add tomatoes and 1/4 cup of water. Add red chili powder and salt. Cover and cook for 10 minutes for the tomatoes to turn soft and mushy. Remove the cover and cook until all the liquid is absorbed and the salsa is almost dry. Take it off the stove and keep aside until use. Place a tortilla on flat surface. Place 3 tbsp of garlic rice, 3 tbsp of sprouts, 3 tbsp of salsa one by one on one side of the tortilla, leaving an inch gap from the edges of the tortilla. Roll once covering the filling, close one side on top of the fold and continue rolling, keeping one side open. 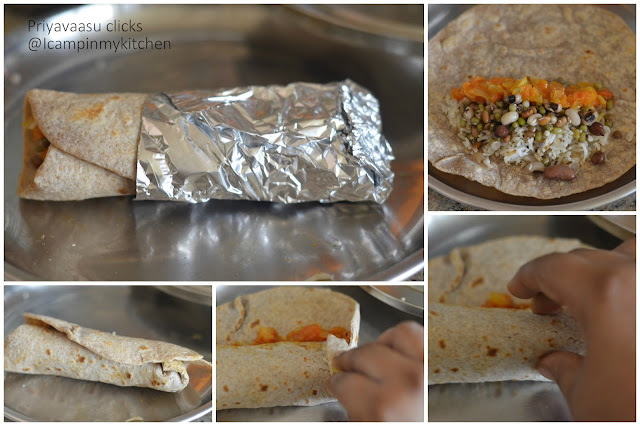 Wrap an alu-foil at one of the roll, to ease holding and also for securing the wrap. Serve warm and enjoy!!! Rice and beans burrito sounds so filling and yum.Nice clicks.. Very interesting ! Like the addition of rice to the burrito. Healthy and delicious treat. You have created an interesting filling for burritos. Super delicious burrito..I am sure this will be such a delicious one to enjoy! Wish u pack me some burrito, wat a fabulous filling.. loving it. you are killing me with your Mexican treats !! I love those cute ramekins too :-) and of the kiddo holding that wrap ! Your have presented them so well. Adding sprouts to rice is such a healthy & nutritious twist to burritos. Love the Indian spin to Mexican burritos. Very innovative indeed. Seems like a takeaway from a restaurant. Lovely clicks. Excellent idea!!! Healthy and tasty lunch option on the go!